Rhonda was born in Zimbabwe, moving to Australia in 1979, then to Singapore in 2000. 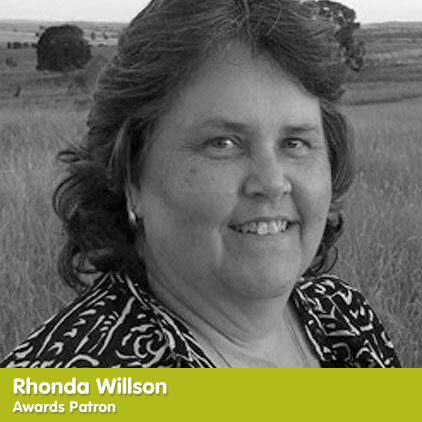 Despite living overseas, Rhonda has maintained her passion for farming through her involvement in the 3,000 ha ‘Gilgai Farms’ complex, carrying a mix of sheep and cattle with some cereal cropping. Gilgai Farms are run in conjunction with Rhonda’s brother, Eric Harvey and other family members. Diminished food security, declining productivity, desertification, biodiversity loss and rapidly dwindling supplies of fresh water are key global issues. The implementation of agricultural practices designed to promote improved soil function offers a practical and almost immediately available solution to many of these challenges. The prestigious Soil Restoration Leadership Awards were established by Dr Christine Jones and Rachelle Armstrong with generous support from awards patron Rhonda Willson. The three women share a vision to improve landscape health, farm productivity and the vibrancy of rural communities through rebuilding soil. Inaugural Soil Restoration Leadership Awards recipients Jim Wedge, Grant Bain, Craig Forsyth, Keith Tunney, Aubrey & Lisa Panizza, Lyndon Brown, David & Joan Cook, John Haselby, Bob Wilson and Ian & Dianne Haggerty were recognised at a special dinner held in conjunction with the ‘Soil Restoration Farming’ forum in Dongara, Western Australia on 19th March 2015. Soil Restoration Leadership Awards recipients have been instrumental in improving soil health and landscape function by promoting the concept of ‘yearlong green’ and biology friendly farming practices in West Australian farming systems. They have achieved impressive results on their own farms while often-times devoting much time and energy to the mentoring of others.